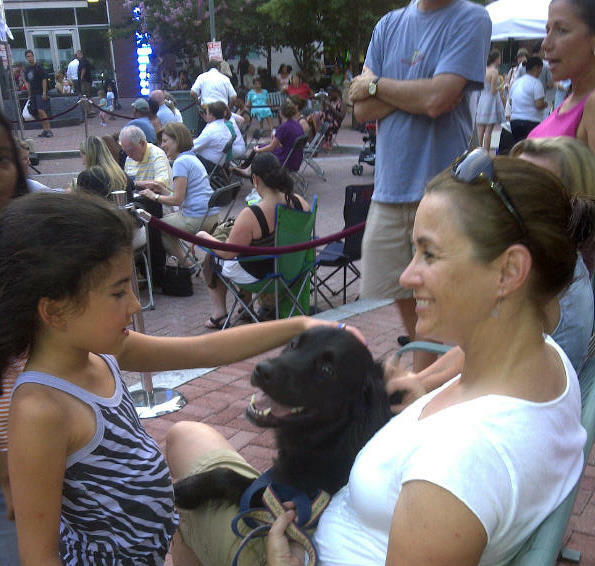 The Village at Shirlington’s summer jazz festival season opened on July 7 with a couple hundred people enjoying music from The Oscillators and the cooler evening temperatures. 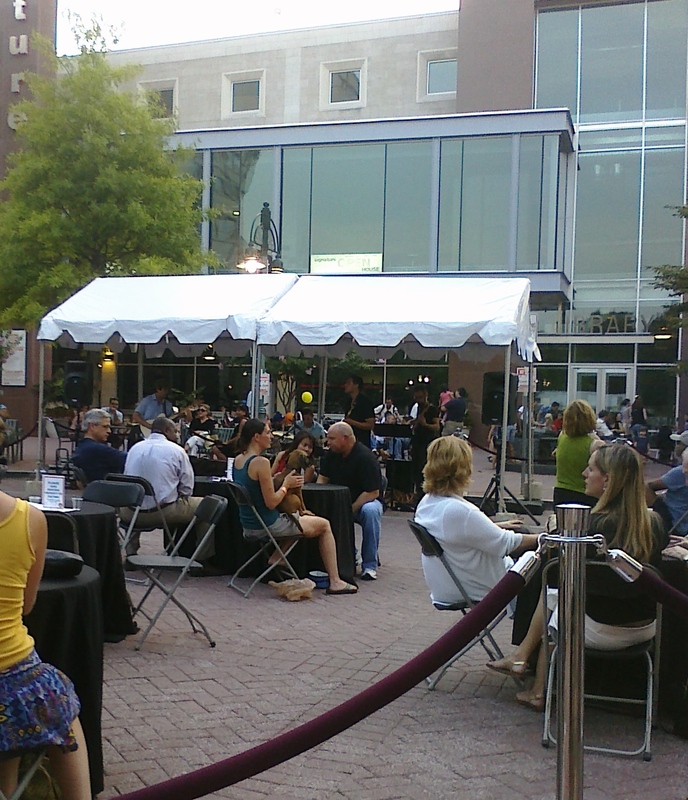 Every Thursday night through August 25 from 6:30-8:30 p.m. the street in front of the Signature Theater and library plaza features a jazz concert and a wine tasting that benefits the Arlington Food Assistance Center. The concert is free; the wine tasting is $5 to taste four wines. The Ocsillators entertained the Shirlington Jazz Festival crowd July 7. Part of the street is blocked off with ropes and set with tables and chairs for the wine tasting, and there are plenty of benches and other seating areas around the plaza. Dogs are welcome both inside the enclosed area and on the plaza. Better yet, you can get a table and enjoy dinner at one of the restaurants within hearing distance of the concert that have dog-friendly outdoor seating, including Busboys and Poets, Johnny Rockets and Samuel Beckett’s Irish Gastro Pub. Sundae makes a young friend during the concert. We took a break from the concert and checked out the newest addition to Shirlington Village, Ah love Oil & Vinegar. The store sells gourmet flavored olive oils and vinegars in delicious varieties like black truffle, pomegranate and parmesan and sun dried tomato. 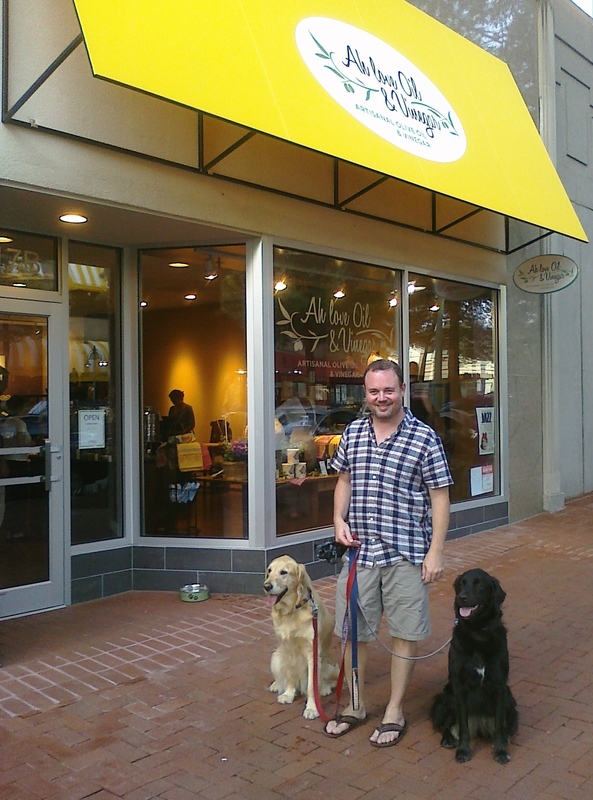 The new Ah love Olive Oil & Vinegar store is dog-friendly. Ah love has partnered with Shirlington’s Dogma Bakery to create bacon olive oil flavored dog ice cream, and they are giving away free mini-cups during the Thursday jazz concerts. From the speed at which my girls scarfed down their cups, I’d say the flavor is a hit! Store owner Cary Kelly welcomes dogs into Ah love if it’s not too crowded. She said they will test reaction to the olive oil dog ice cream during the concerts all summer, and if feedback is positive they may carry it permanently. 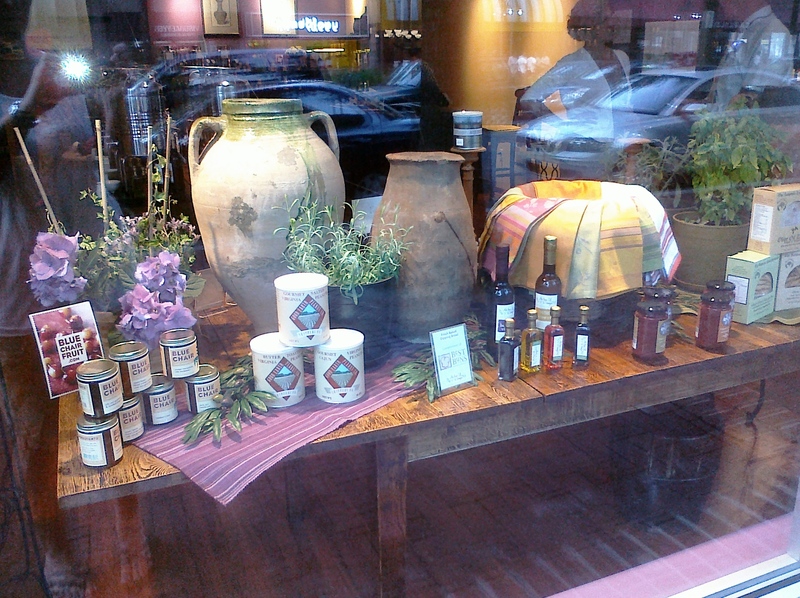 Ah love's front window features just a few of their gourmet items for sale.